This section introduces one example using R core audio interstage and output transformer: 2A3 push-pull 20W monaural power amplifier. Maximum output of this amplifier is 20W that is quite enough for family use. The main features are excellent performances (low distortion, wide bandwidth, high output, and low noise level) that are difficult to be achieved by the single-ended amplifier, and good sound quality straightforward that is particularly characterized by interstage transformer coupled circuit. 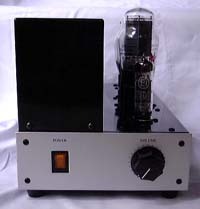 For this amplifier, we used 2A3 made by Sovtek, Russia. 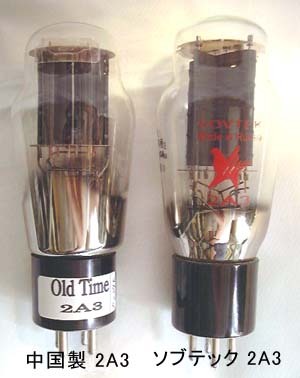 Different to popular 2A3 made by RCA or in China that have two electrode units in parallel connection, Sovtek 2A3 has a single electrode very similar to 300B. Overall dimensions are also one size larger than ordinary 2A3. The published rating is the same as ordinary 2A3, but in a practical sense, it seems to have an extra power handling capacity. The quadruple that we used this time are well matched and have no irregular faint noises that are heard occasionally with 2A3 made in China. Main rated characteristics of the tube are as follows. The design objectives of this amplifier are: high performance, easiness for collecting component parts, and easiness for building the amplifier. To drive up to the grid + field of 2A3 by interstage transformer to obtain high output 20W. 6BM8: triode unit for voltage amplification stage -- 6BM8: pentode unit in triode connection driver -- interstage transformer -- 2A3 fixed bias -- push-pull output transformer 5Kohms. 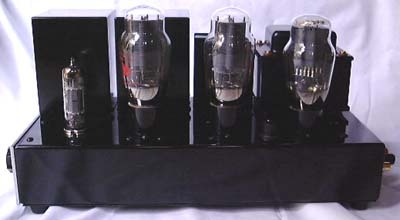 The voltage amplification stage and driver use 6BM8 that is well-known as triode-pentode multiple-unit small power tube. The tube operation is class A2 push-pull that is driven up to grid + field in order to obtain the power efficiently out of 2A3 whose plate dissipation is 15W. Plus, fixed bias system is employed for efficient use of the supply power voltage. The operating condition of the output stage is as follows. Up to about 12W, the operation is class A1 and from 12W and above class A2 that is driven into grid + field. Since the grid current flows in grid + field, a powerful driver stage is necessary not to suffer the grid current and to supply high voltage. The fixed bias circuit must absorb the grid current flowing in the grid of 2A3 not only supplies the negative voltage for biasing the grid of 2A3. When the grid is swung into grid + field, the signal is rectified by the grid and thus generating DC component. By this, the grid voltage goes further to negative side, which reduces the plate current and thus suppresses the output increase. In order to increase efficiently the output power, the fixed bias circuit must retain the bias voltage constant even if the grid current flows. In this amplifier, an MOS-FET source follower circuit is installed after the normal fixed bias circuit to absorb the grid current. The reason of lay-outing Nch MOS-FET on the opposite side to the general voltage regulator source follower is that the grid current works to increase the bias voltage not to decrease it. Nch MOS-FET consumes the current from the grid that works to increase the bias voltage and thus keeps the voltage on the grid constant. The combination of 6BM8 pentode unit in triode connection and RC-20 interstage transformer obtains high power without being affected by the grid current. 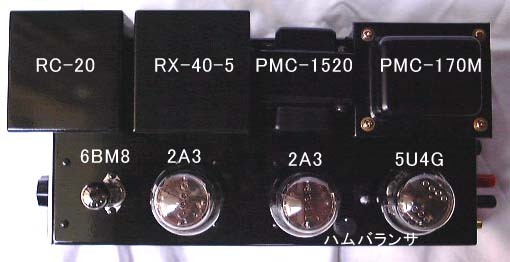 The connection of RC-20 interstage transformer is primary in series and secondary in push-pull connection. 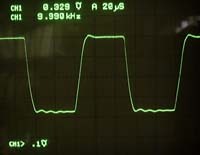 Phase inversion is made by 1: 0.9+0.9 and amplification operation by 1:1.8. The secondary of RC-20 is open (without load). This enables both to obtain the natural and unconstrained sound quality proper to open operation and to feed entire supply current from the interstage transformer to the grid of power tube. The operating condition of 6BM8 pentode unit is effective plate voltage 190V, plate current 10mA. 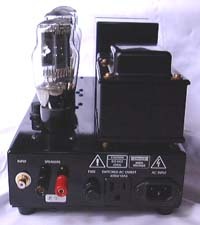 The voltage amplification stage uses 6BM8 triode unit. Plate load resistance is 100Kohms, putting the unit on a standard operating condition. This unit is directly coupled with the next driver stage. High-cut filter made up with 10Kohms and 50pF and provided at the top of input is for suppressing incoming high-frequency noise or leakage noise from SACD. 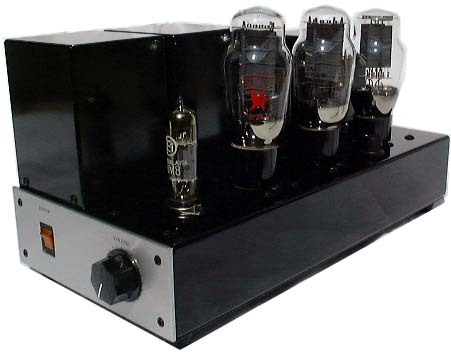 The gain of this amplifier without negative feedback is 65, being considerably high for use. Besides, the damping factor is about 1.5 because of the combination of the plate resistance of 2A3 being sufficiently low but with the output transformer of 5Kohms load between P-P. Thus, the damping at low frequency would be poor. So, we employ negative feedback to reduce the gain and increase the damping factor. After providing 12dB of NFB, the gain will become 16, quite appropriate to use. However, it is practically difficult to provide an overall negative feedback 12dB to the circuit including two transformers: interstage and output transformer. Therefore, for this amplifier, we have employed both 6dB minor negative feed back from the plate of driver tube 6BM8 pentode in triode connection, and 6dB major negative feedback from the speaker terminal of the output transformer. With 6dB major negative feedback, the damping factor is appropriately set about 3.8. Major and minor negative feedback presents a very stable Square wave response in spite of the circuitry including two transformers. Power transformer is a reasonable multipurpose transformer PCM-170M of Noguchi. DC 325V is obtained by diode center tap rectification of AC 290V. Choke coil is a multipurpose PCM-1520 of Noguchi. Electrolytic capacitor 400V 100uF is a small-sized general purpose radial type made by Unicon that has once been distributed by Softone. Negative voltage supply for fixed bias is –100V that is made from AC 70V half-wave rectification. Power supply 2.5V 2.5A for 2A3 filament is DC to reduce hum noise level. Two lines of DC2.5V are obtained each by bridge rectification of two windings of 3.8V 3A that are found between the terminals 6.3V-2.5V of PMC-170M. After the rectification, the ripple components are reduced by 10,000uF. Chassis is a Softone's MS-2. Shorter sides are used for front and rear. Setting two chassis side by side as stereo amplifier will have the same width as full size component amplifier. From the front of the chassis (left side on the photo), 6BM8, a pair of power tubes 2A3, and rectification tube 5U4G are lined up. Between the power tube and rectification tube is the potentiometer for hum balancer. We recommend one-point grounding at the fixing screw of 6BM8 socket. Two-point grounding that connects to ground also near the power transformer is not recommendable. Since the filament requires high power, the residual noise level varies depending on the ground wiring sequence. Observe the wire connecting sequence indicated in the wiring diagram to wire the ground line. Parts are very jammed near 6BM8. Pay attention not to have unwanted contact with each parts. For example, cover the lead wire of the parts with insulation tube (empire tube) and mount the parts carefully. It is a well-balanced and steady sound quality. Rhythms performed by an orchestra are clearly heard. It may be well expressed to say that the silence between the sounds can be clearly noticed. The established reputation of 2A3 is soft sound. However, there is no particular softness in the sounds. The impression is solid and massive sound based on well-developed mid and low range. It is probably because of high power and transformer coupled circuitry. Fortissimo in music is performed in a natural and unconstrained manner. High performance characteristics and good sound quality seem to be combined quite successfully. 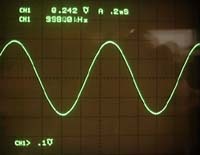 Output increases linearly up to 20W.The waveform does not lose shape drastically beyond 20W and the output increases gradually up to about 25W. 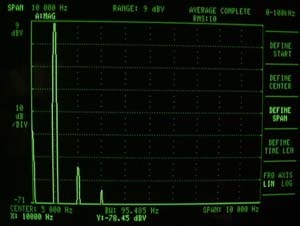 Even without NFB, the frequency bandwidth is 10Hz to 20KHz (+0, -3dB) covering approximately the audible frequency range. Despite of transformer coupled 2-stage circuits and open secondary winding of interstage transformer, the attenuation characteristics are plain both at low and high ends. 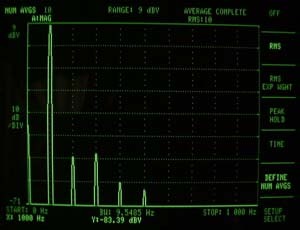 A little peak and dip are observed beyond 100KHz. 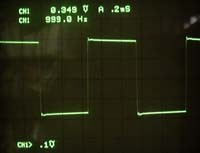 However, since the amplifier's gain is reduced in this zone, this does not present a serious problem. The low-end attenuation at 10W output is due to the saturation of output transformer. With 12dB NFB in minor and major loops, the bandwidth expands to 10Hz to 55KHz (+0, -3dB). Please look at the low-end characteristics at 0.1W and 1W output. They are not at all attenuated at 10Hz. Besides, there are no undesirable rise in audible frequency that is frequently observed in the transformer-coupled amplifier. Both low and high ends retain plain frequency characteristics also after negative feedback. 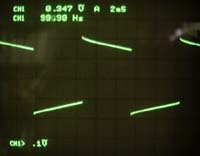 At 100Hz and 1KHz the waveforms are very fine. 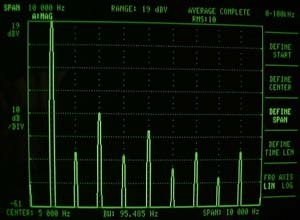 At 10KHz a slight ringing is observed due to peak and dip existing beyond 100KHz. The output is quite stable with capacitance load. 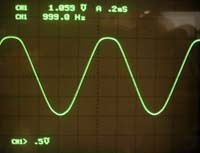 At 1KHz distortion canceling works effectively to obtain a very low distortion factor in a wide range. 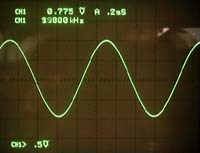 At 100Hz and 10KHz distortion canceling is not so significant as at 1KHz but the distortion level is excellent for non-NFB amplifier. Around 12 to 15W, the operation switches from class A1 to A2 where the grid current flows. At this transition point, the distortion factor presents a slight unevenness but it is negligible. Because of low residual noise level, the distortion factor does not rise at low output operation. 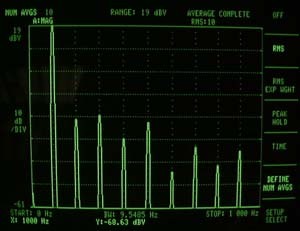 The graph above represents an excellent low distortion factors: 0.055% at 1KHz, 1W, 0.6% at 10W, and 3.2% at 20W output. If the distortion factor at 10KHz is a little bit low, the performance should be excellent. This reveals the limit of employing the interstage transformer for both phase conversion and step-up. Both 100Hz and 1KHz contain lower harmonic components around 4th harmonic up to 1W and the higher the degree becomes the lower the distortion, which presents excellent harmonic distortion characteristics. Odd number degree harmonics are not particularly dominant although this is a push-pull amplifier. At output 15W, many higher harmonic components appear and odd number degree components are more dominant than even number degree components. This demonstrates well the characteristic proper to the push-pull amplifier. The residual noise level is 0.1mV. This is satisfactorily low for the direct-heating power tube. The noise figure of 6BM8 is also excellent. Without NFB, the damping factor is low as 1.5. There is concern that it comes short of damping in low range for some kinds of speakers. 6dB major NFB increases the damping factor to 3.8, suitable for various kinds of speakers. 6BM8 is Ei brand, Yugoslavia. I forget where I bought at what price. But at reasonable price anyway. 2A3 is made by Sovtek, Russia. I bought one pair at 6,500 yen at Classic Components at Akihabara. 5U4G is also made by Sovtek, Russia. Sovtek 2A3 & 5U4G and Ei 6BM8 are all at reasonable price, but they operate very much satisfactorily. The resistors (2W, 5W) are incombustible (metal oxide film) resistors. Its performance and stability may be suitable for the tube amplifier operating in high voltage. Electrolytic capacitors are all right with reasonable multipurpose small size type. Capacitors made in recent years (within a couple of years) would be better than old large size type. It is nothing unusual that multipurpose capacitors having quick turnover of sales achieve better results than special audio capacitors. Interstage transformer is Softone RC-20 and output transformer is Softone RX-40-5. Power transformer is Noguchi PCM-170M and choke coil is Noguchi PCM-1520. Both are reasonable and good quality products. We use Softone MS-2. This is a punched and painted easy-to-build chassis. We recommend UL1015 standard wires . AWG22 meets the case for low current path wiring and AWG20 for high current path wiring. Too large size wire would be difficult for wiring. The table below shows the parts necessary for one unit of monaural amplifier. Only main parts are listed. Screws, wires, and small parts omitted in the table are also necessary. Please note that there are unknown or uncertain descriptions on some manufacturers, shops, and prices.